Pat Brady: Illinois Republicans may oust pro-gay rights party chairman. 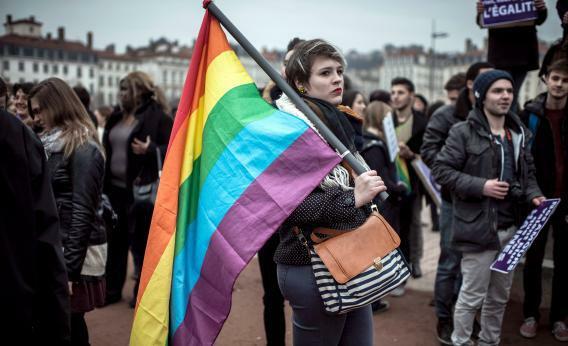 A young girl holds a rainbow flag during a demonstration to support gay marriage and adoption on January 26, 2013 in Lyon, central France. Republican strategist Liz Mair, a GOProud advisor, is all over the turmoil in Illinois. Part one: Party chairman Pat Brady, who watched the GOP fall back to rump status in the post-gerrymander year of 2012, urged his legislators to support the legalization of gay marriage. To the surprise of no one, Republican officials started attacking Brady, leading to one of the best things said about a state chair this year—take it away, Bobbie Peterson. He’s a pretty face for TV. He can speak well. Period. But what’s coming out of his mouth is not what the Illinois Republican party is about. The National Organization for Marriage, which also had a lousy 2012, piled on: “Tell the Illinois GOP today that Pat Brady must go,” said NOM’s Brian Brown. Two months after Brady make his statement, on Saturday, Illinois Republicans will vote on whether to oust him. It’s not like he presides over a party that got more liberal in 2012. Quite the contrary! Jim Oberweis, a conservative who kept blowing winnable races for the party, is now a state senator. The party’s moderate wing was felled along with Mitt Romney, dropping from 54 to 47 state reps and from 24 to 19 senators. Brady is counting on the verbal support of Illinois’ last two non-jailed Republican governors,* and on a supermajority requirement for ousting a chairman. 24-odd hours from now, we’ll know whether a party chairman was purged, for the first time, over his gay marriage stance.